This day, 12 April, is as freighted with important events as any in the calendar. In 1204 on this day, the Crusader armies ostensibly arrayed against “infidels,” began the bloody sack of Christian Constantinople. It was on 12 April 1861 that Confederate guns opened fire on the Union hold-outs in Fort Sumter and thereby set off the American Civil War. It was also on 12 April 1945 that President Franklin Roosevelt collapsed and died from a massive stroke. And there are positive events associated with this day as well, including Yuri Gagarin’s successful mission as the first human in outer space. Today, however, I again take the privilege to write about a very personal anniversary upon this day. I cannot help but note, as we approach Easter, that we are reminded that the reason for this holiday is to celebrate Life. For Christians, this is always a celebration of Life Everlasting and the Salvation that Jesus made possible for Mankind. Pre-Christian traditions also took time at this high point of Spring to celebrate the rebirth of nature after the bleakness of Winter. Familiar Easter symbols such as rabbits, (life abundant) eggs, (life emerging from lifelessness) and bright flowers (life reborn) have their origins in these Pre-Christian celebrations, though the symbolism applies fittingly to the Christian celebration. Yet, as the Book of Common Prayer reminds us, in the midst of life we are in death. Next Friday, Good Friday, commemorates the crucifixion of Jesus and his earthly death. 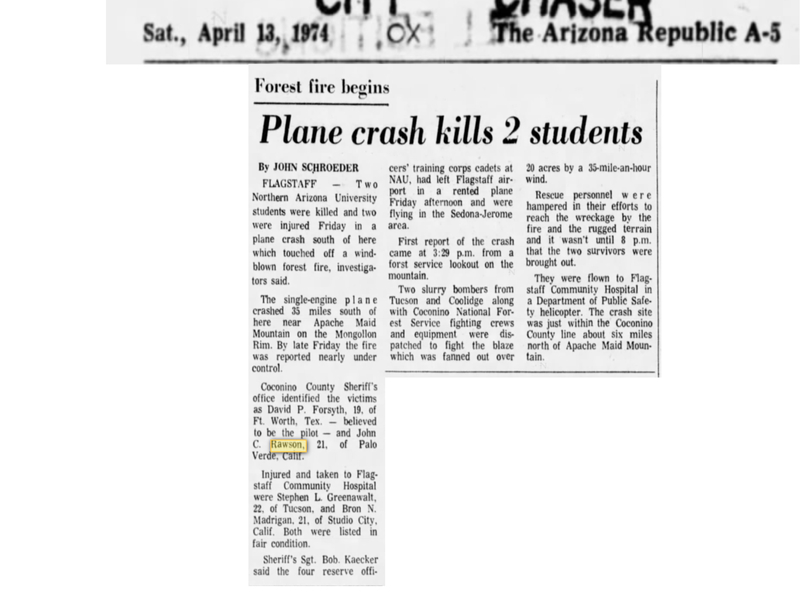 For the past forty years, each Good Friday is also a time of personal remembrance for me, because it was forty years ago today, on Good Friday, 12 April 1974, that my brother Chris was killed in an airplane crash. 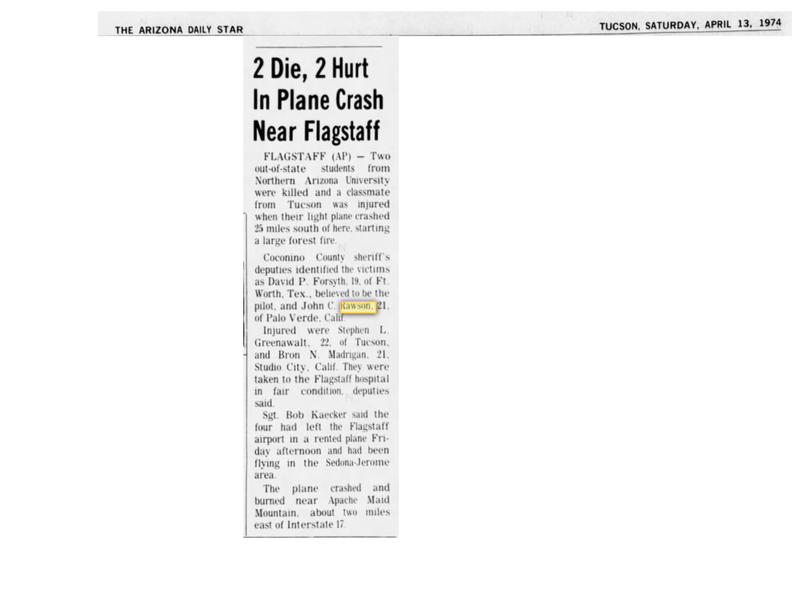 Though it has now been forty years, this loss is still with me. It is not a fresh pain, of course, it simply is a loss that I have grown accustomed to, but which nevertheless remains a loss. 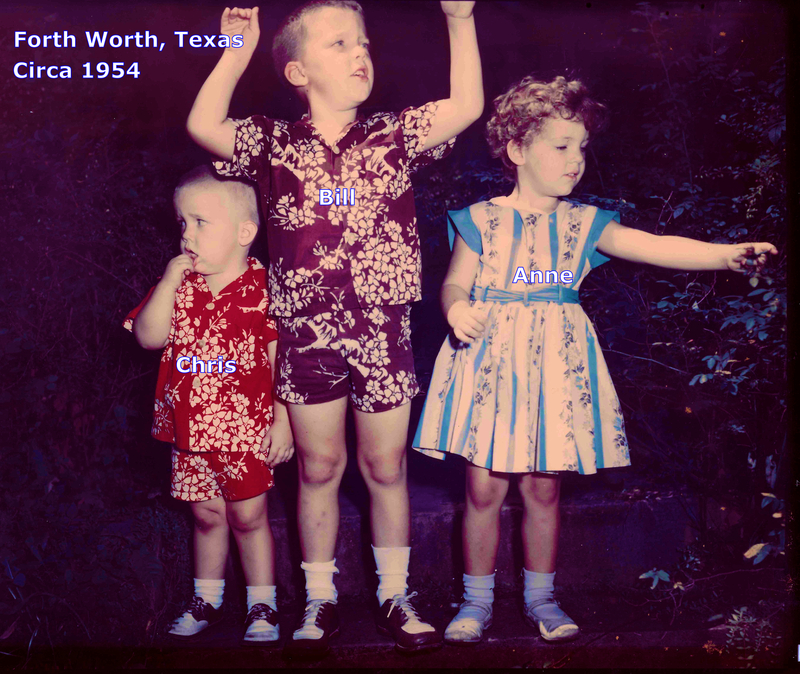 Chris was a wonderful brother. The passage of time, as is natural, has caused me to forget any flaws and to remember only the good things. Yet I can say this unreservedly even so. Chris had so many interests that, as a youngster, he was often described by his teachers as “unfocussed.” I think that was a fair description, but I wonder why anyone might have an expectation that an inquisitive and energetic youngster should be “focussed.” He enjoyed nature and the outdoors, and he delighted in hiking and horseback riding. He tried his hand at turns in painting, wood carving, and clay sculpture; he also enjoyed cooking and baking. In high school he had the distinction of being the very first male student to enroll in a “Home Ec” class! When Chris was in his early teens, at a time when my father was considering an employment opportunity in Saint Louis, Chris decided to design an old-fashioned flatboat to take on a drift down the mighty Mississippi. He drew elaborate plans, did research on materials and costs, and spent time at the library to learn about similar designs. Ultimately, he built a 1/20th scale model of his plans in balsa wood. This plan was never realized (my father declined the job offer) but we had that wonderful model for many years. 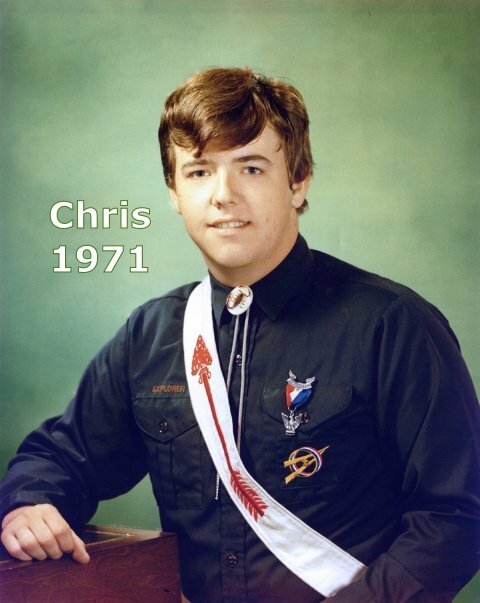 Chris was deeply involved in Scouting and attained the rank of an Eagle Scout. Chris had many interests and enthusiasms. 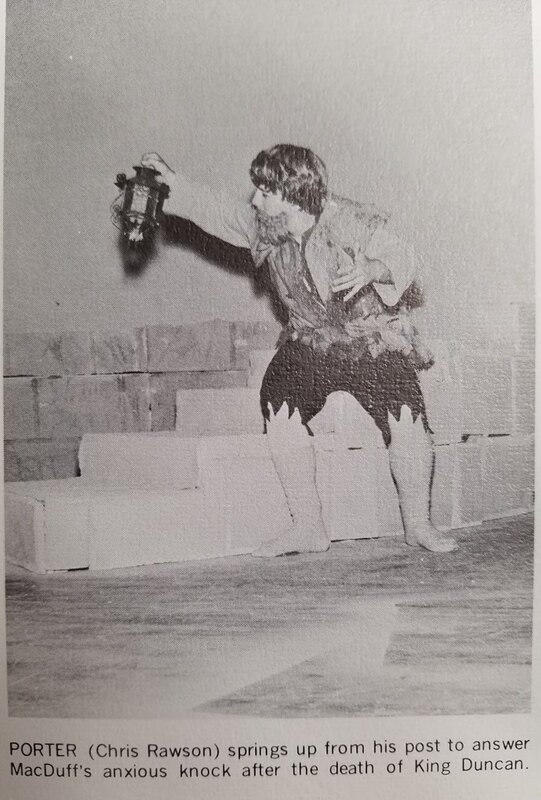 He loved drama (he played the comic-relief role of the porter in a production of MacBeth) and he loved stagecraft (he once designed the set for a college production of Jesus Christ Superstar.) He was fascinated by film and the movie business and he made several 8mm films, including his magnum opus, Kincaid’s Gold, a thinly veiled rip-off of a Hollywood film of similar name. In the last year of his life his great passion was flying. Chris joined the Air Force ROTC. 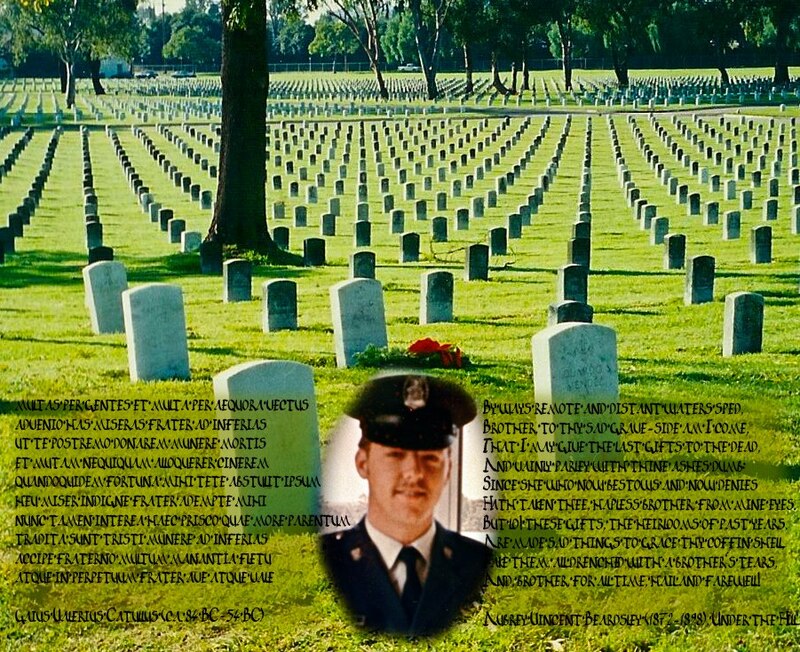 He took training at Lackland Air Force Base in San Antonio, Texas in the summer of 1973. The training was intense, but he took the time to mail a small Texan cactus to me and Rob for our cactus garden. During the next year he took opportunities to fly whenever he could. 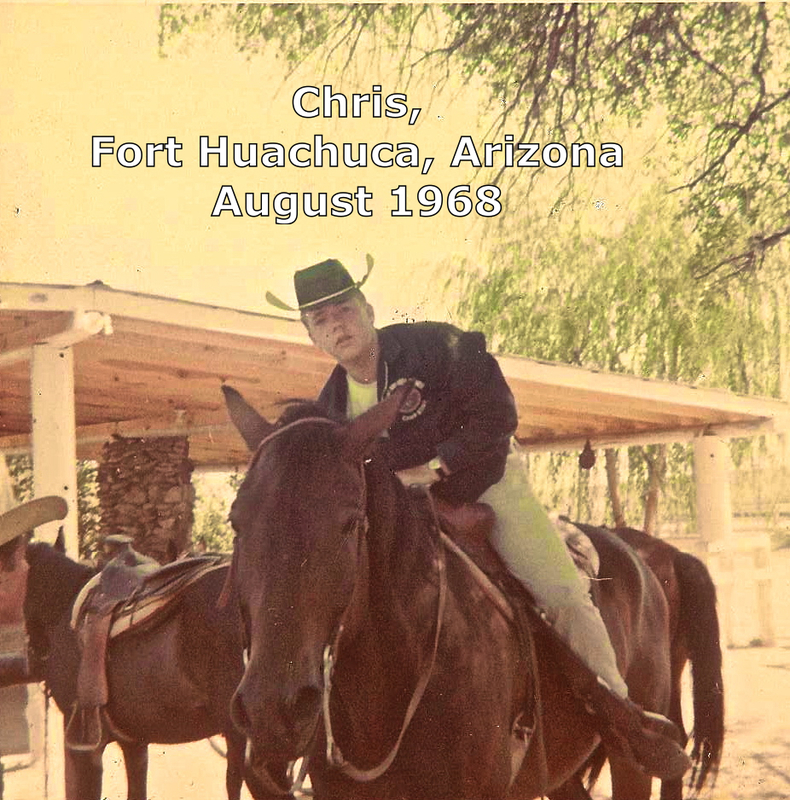 In the Spring of 1974, Chris was eagerly looking forward to completing college and starting a career in the U.S. Air Force. He had an opportunity to take an elective class in a field outside his major, and so he decided to take a class entitled, “The American Way Of Death.” The course examined several works about the modern manner of dealing with death and dying, and the reading list included Elisabeth Kübler-Ross’ seminal examination of the stages of grief, On Death And Dying. Also among the works listed was The View From A Hearse, which offered a specifically Christian perspective of the issues of death and dying. Chris found this class especially fascinating, though I know not why, and he made a particular point of leaving these two books with me and Rob to read when he returned to school after his Spring break at the end of March that year. I read these books that first week of April 1974. I have both books in my library still. 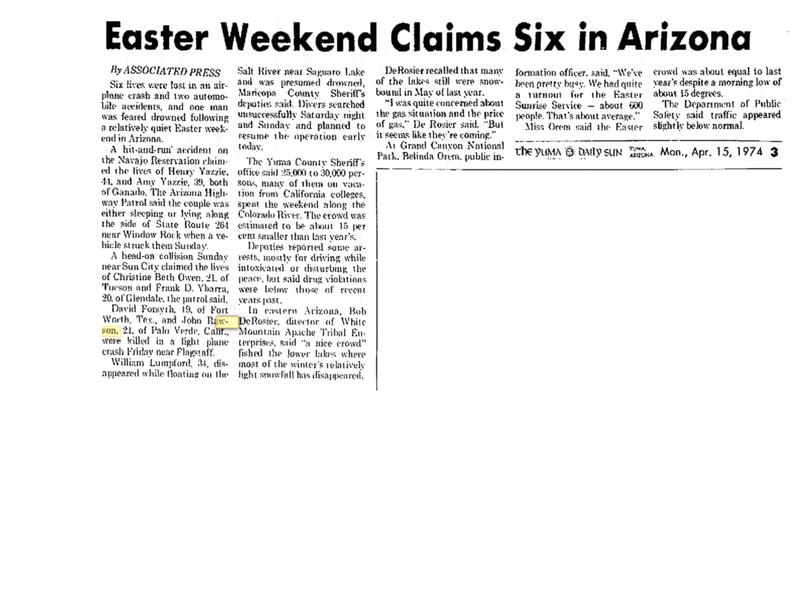 Good Friday, 12 April 1974 was a stunningly beautiful day in Southern California. The air was clear, the temperature mild. It was a day so perfectly lovely that I well might have remembered it ever after just for that. I even recall thinking that afternoon what a fortunate day it was. Rob and I had arisen at 4:00 am to accompany my mother to the Los Angeles Flower Market to pick up the stock for the Easter weekend at our flower shop. After we had finished cleaning and preparing the immense load of flowers back at the shop, Rob and I went to a local lunch counter. We ordered chicken salad sandwiches for lunch, only remembering too late that we should not have ordered meat on Good Friday. Fortunately, when the waitress brought the sandwiches, the cook had gotten the order wrong: the sandwiches were tuna! (Which was just fine for Good Friday.) She apologized and offered to fix our order, but Rob and I explained how happy we were for the substitution. It certainly seemed a fortunate day. After our lunch, Rob and I walked to our friend Mike Sherwood’s home which was not too far away. We three decided to walk to our friend Ed Kraus’ house. Somewhere in our walk we picked up another friend, and we kept walking. We decided to hike along a dry stream, finally resting in an immense storm water culvert far below the roadway; it was our ‘secret cave.’ We leaned against the curved, corrugated steel walls of the culvert and spoke of many things, including mortality and fate. We also commented upon the stunning beauty of the day. At length, we decided to head back to our homes, once more thinking how fine the day had proven to be. We were watching the broadcast of Ben Hur that evening when the telephone rang, delivering the stunning, tragic news. To this day, I still cannot watch the scene where Messala and Ben Hur meet in the grand hall of Hur’s urban villa. It remains too powerfully evocative of that horrible call. I can never forget hearing my Mother’s immediate reaction as she received the call, nor shall I ever forget my Father’s stoic, calm, controlled, and very “military” handling of the overwhelming news. His long career in the U.S. Air Force had trained him to stay collected and effective. It would not be until five days later that my Dad broke down and gave vent to the terrible pain he felt. In all my life I had never seen the man cry, even a little. Yet he broke down and wept uncontrollably for perhaps fifteen minutes as we sat with the casket before the Rosary service. Rob and I hugged him as tightly as we possibly could, as he cried and cried. My world was rocked nearly as much as it was upon first hearing the news. 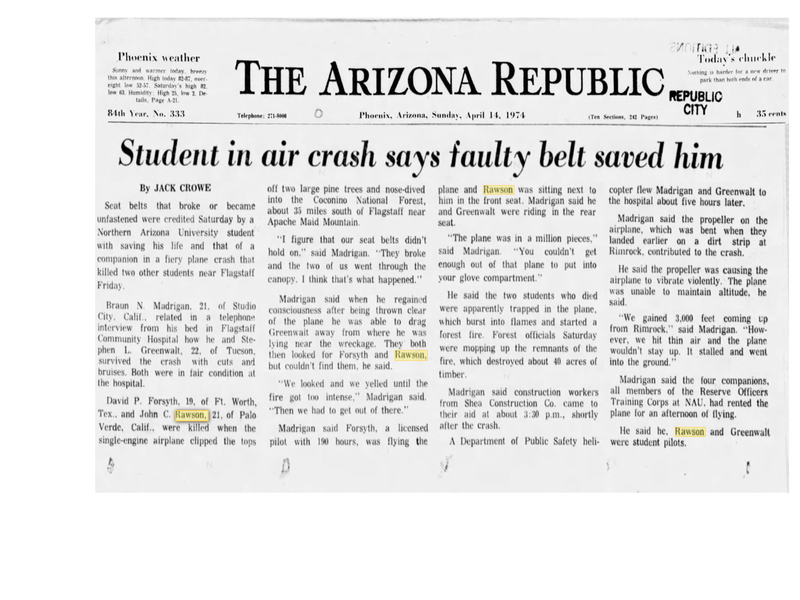 Immediately after taking that fraught phone call, my Father called his long-time friend and Air Force colleague, Don Davis, and though the hour was late and the trip long, Colonel Davis set out immediately to come to be there for us. The next day the whole Davis clan joined us, and though the enormity of the loss remained, the care and comfort of dear friends – family, really, in all but blood – helped to make a dreadful time vastly less dreadful. 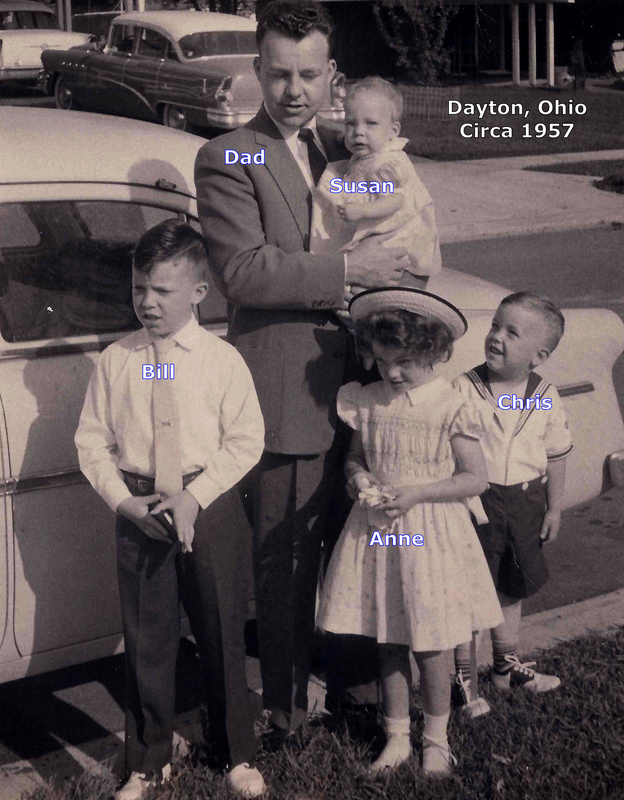 My Grandmother Rawson, the last of our grandparents, came in that Easter Sunday afternoon from Washington, D.C., and my Uncle Mike and Aunt Kiki arrived from Washington that Monday afternoon. Our house was filled with friends, and family, and relatives, and the love and comfort was so thickly tangible that it truly eased the pain. After a few days, it actually became possible to laugh and to feel a bit light-hearted, despite the sorrow. The funeral service was held at Saint John Fisher Catholic Church on Thursday 18 April. The congregation’s recently appointed pastor, Father Vince Barrett, celebrated the funeral mass and delivered a brief but fitting homily. Among the hymns that were sung, Amazing Grace stands out in my mind. That hymn retains for me a capacity to bring moisture to my eyes. As we exited the church, my Uncle Mike played the mournful, traditional piper’s lament, Sleep, Dearie, Sleep. Mike had not brought his pipes with him when he travelled to California, but we were fortunate that Eric Rigler (who was at that time just starting what would become his renowned career as a piper; you have most likely heard his music on a movie soundtrack) offered to lend his bagpipe for my uncle’s use. 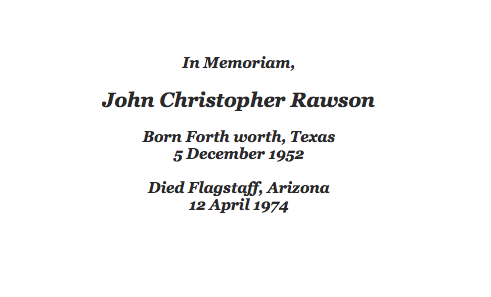 We buried Chris at Los Angeles Veterans Cemetery in Sawtelle/Westwood, Los Angeles on 18 April 1974. As we rode in the limousine to the graveside, a very long drive from the Palos Verdes Peninsula to Westwood, we told stories about Chris, and as we became more and more enwrapped in the memories, we began telling the sorts of tales of silliness and calamity that we all know of one another, and we laughed. It did not seem irreverent. As Shaw observed, “Life does not cease to be funny when people die, any more than it ceases to be serious when people laugh.” I did feel bad about making the limo driver laugh, though, for he was quite needlessly apologetic. After we returned home, after the post-funeral feast, life began to resume an aspect of normality. But it was never the same. It never has been, of course, which is inevitable: life is never the same, no matter what events or circumstances come about. At that time, and in the decades since, I tried to understand the “why” of this loss. There was no reason, no purpose, no greater cause served by Chris’ death. It simply happened. In the midst of life we are in death. On the threshold of the Easter celebration of Life and Rebirth a life was lost. I long ago concluded that the “why” of this loss will remain unknown to me in this life. There is no compensation possible, there is no “getting over it,” there is only getting used to it. And I have done so, though a chance recollection can still cause me to choke up, and a particularly emotional scene in a drama can bring on the waterworks. Recently, the chorus I sing with, The Turtle Creek Chorale, sang a powerful and moving piece, Emily Dickinson’s poem “Will There Really Be A Morning?” set to the beautiful music of composer Victor Johnson. When first we sang through the work, I had to slip out of rehearsal for a private moment of overwhelming emotion, because I so clearly recalled that very question in my own mind that sad night: “Will there really be a morning?” And, yes, there will be. Life goes on as it must, and will in any case. And it would serve no purpose to be angry or resentful for the loss. It is not unjust; it is not just. It just is. But I write this not to bring down peoples’ spirits as we approach a wonderful holiday, rather I write this to remember a fine person who has been gone far longer than he lived. I recall him very often, and in my mind he well deserves to be remembered. So as we come to celebrate Life and Rebirth, as we rejoice in Spring and think of delightful things, we also remember too those who are not here with us. The delight of Spring and the mystery of Easter embrace both reflections. 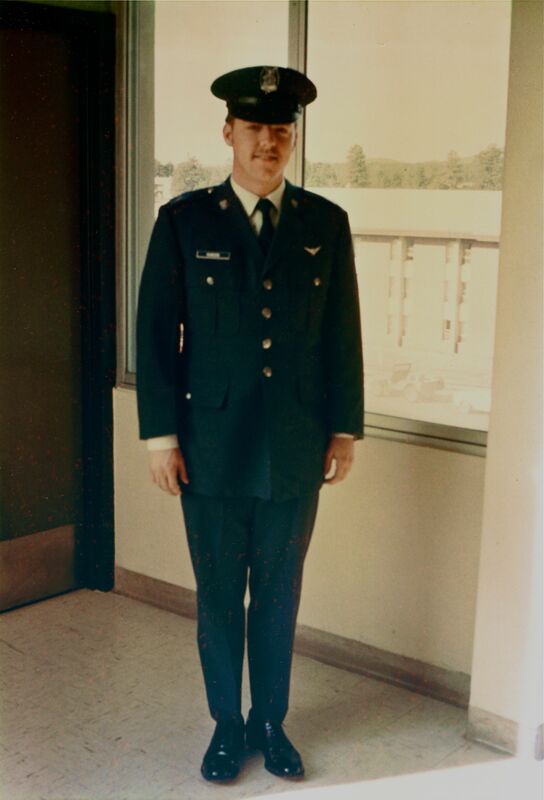 Chris Rawson, USAF ROTC. Taken 11 April 1974, the day before he died. I have read every word of this Remembrance and am indeed honored to have shed a tear in honor of the fallen brother of my dear friend Jamie. What a beautiful tribute for Chris. May he always Rest In Peace, surrounded by such loving care, as offered in this beautiful Tribute.